Hang on why has he got one sleve rolled up. shouldn't it be one trouser leg? Ewww. Does anybody want to hold this? has the motion crapped itself again? I thought poo jokes were funny. with photos in the window which are deliberately blurry. It's a disgrace! ...called 'I. 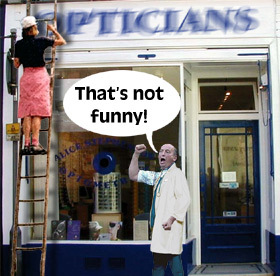 Strain Opticians' - the guys name is Ian I think.